Archimedes' Quadrature of the Parabola is probably one of the earliest of Archimedes' extant writings. In his writings, we find three quadratures of the parabola (or segment enclosed by a straight-line and a section of a right-angled cone), two here and one in the Method 1, probably one of his last works among extant texts. The two here take very different approaches, and yet more different from that in the Method. The issue here has nothing to do with the use of the principle of the balance that distinguishes the mechanical proofs, 6-15 from the rest of the book. The first quadrature, 16-17, takes a triangle circumscribing the segment and divides up the segment and the triangle into trapezoids and triangle constructed by lines parallel to the base of the segment and lines parallel to the diameter, which is also parallel to one side of the circumscribing triangle. These form different sets which compress the segment. Among these trapezoids and triangles is a set on the curve, which are used to fuel the reductio. The geometrical construction instead uses a series of inscribed triangles, which in the Equilibria of Planes II 2 is called familiarly inscribed and forms the foundation for the analysis of the centers of weight of parabolas and cross sections of parabolas in that book. These approximate the segment from within. The reductio is based on a summation of a series, a1, ..., an where each ai+1 = 1/4 ai. The sum is then 4/3 a1 + 1/3 an, which each a1 will turn out to be the next approximation of the parabola. Prop. 17 Note that with this theorems, Archimedes' presentation becomes less informal, i.e., the enunciations of the theorems do not require reference to a diagram. Quadrature by geometrical means (props. 18-24). Archimedes to Dositheus, greetings. After I heard that Conon, who fell no way short in our friendship, had died and that you had become an acquaintance of Conon and were familiar with geometry, we were saddened on behalf of someone both dear as a man and admirable at mathematics, and we resolved to write and send to you, just as we had meant to write to Conon, one of the geometrical theorems that had not been observed earlier, but which now has been observed by us, it being earlier discovered through mechanical means, but then also proved through geometrical means. Some of those who worked earlier in geometry attempted to prove (draw) how it would be possible to find a rectilinear area equal to a circle that�s given or a segment of a circle that�s given, and afterwards they attempted to square the area enclosed by the section of the cone as a whole(*) by assuming some lemmas that were not readily admissible. For this reason, these were condemned by most people as not being discovered by them. But we do not know of anyone previously who attempted to square the segment enclosed by the straight-line and right-angled section of a cone, which has now, in fact, been found by us. For it is proved that every segment enclosed by a straight-line and right-angled section of a cone is a third-again the triangle having its base as the same and height equal to the segment, i.e., when this lemma is assumed for its demonstration: that is possible for the excess of unequal areas by which the larger exceeds the smaller, by being added to itself, to exceed any proposed finite area. Earlier geometers have also used this lemma. For they use this lemma itself to demonstrate that circles have to one another double ratio of the diameters, and that spheres have triple ratio to one another of the diameters, and further that every pyramid is a third part of the prism having the same base as the pyramid and equal height. And because every cone is a third part of the cylinder having the same base as the cone and equal height, they would assume some lemma similar to the one mentioned to prove (draw) them . It follows that we have no less conviction in each of the mentioned theorems than those demonstrated without this lemma. It is adequate given that those presented by us have been raised to a conviction similar to these. And so, having written up the demonstrations of it we are sending first, how it was observed through mechanical means and afterwards how it is demonstrated through geometrical means. But first there are also proved (drawn) conic elements that are useful for the demonstrations. Farewell. Does he mean the ellipse, as Heiberg (Archimedes II 263 n.) and Heath (Archimedes, 233 n.), or, as J. Beere suggested to me, “cone generally,” as opposed to any of the three classes, or, as Knorr suggests ("Archimedes and the Elements," AHES 19 (1978), 232 n. 44), perhaps, but not necessarily, with emendation ('plane' for 'straight-line') 'the area bounded by the section of the whole (right/isosceles) cone and/by a plane'? 1. If there is a section of a right-angled cone, on which is ABG, and BD is parallel to its diameter or itself a diameter, and AG is parallel to the line touching the section of the cone at B, then AD will be equal to DG; and if AD is equal to DG, then AG and the line touching the section of the cone at B will be parallel. No proof appears in Quadrature of the Parabola. Here are proofs. 2. 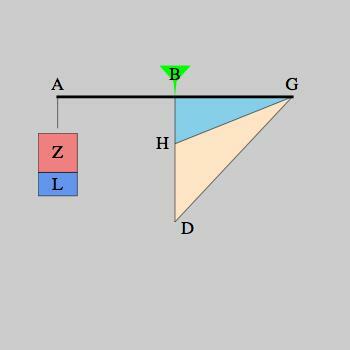 If there is a section of a right-angled cone, ABG, and BD is parallel to the diameter or is itself a diameter, and ADG is parallel to the line touching the section of the cone at B, and EG is touching to the section of the cone at G, then BD, BE will be equal. Case where BD is parallel to the diameter (with converse). 3.If there is a section of a right-angled cone, ABG, and BD is parallel to the diameter or is itself a diameter, and certain lines parallel to the line touching the section of the cone at B are drawn, then as BD is to BZ so is AD in power to EZ. Let there be a segment ABG enclosed by a straight line and a section of a right-angled cone, and from the middle of AG let there be led BD parallel to the diameter or itself a diameter, and let straight line BG be joined and extended. If in fact some other line ZQ parallel to BD intersects the straight line through points B, G, ZQ will have the same ratio to QH which DA has to DZ. 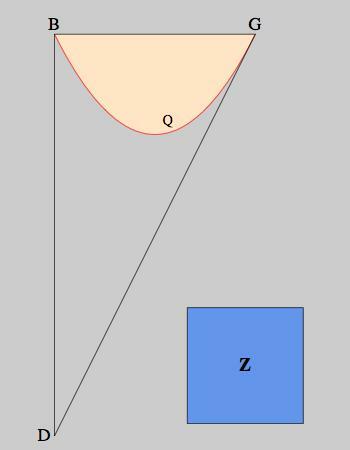 Let there be a segment ABG enclosed by a straight-line and a section of a right-angled cone, and from A and parallel to the diameter let ZA be drawn, and from G and touching the section of the right-angled cone at G let GZ be drawn. 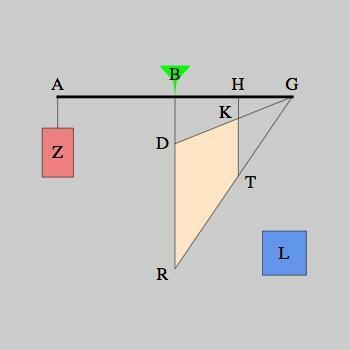 If in fact some line parallel to AZ be drawn in triangle ZAG, the line drawn will be cut in the same ratio by the section of a right-angled cone as AG by the line drawn [proportionally], but the segment of AG at A will be homologous (same parts of their ratios) as the segment of the line drawn at A. Let there be conceived the proposed seen plane, [which is under contemplation], upright to the horizon and let there be conceived [then] things on the same side as D of line AB as being downwards, and on the other upwards, and let triangle BDG be right-angled, having its right angle at B and the side BG equal to half of the balance (AB being clearly equal to BG), and let the triangle be suspended from point BG, and let another area, Z, be suspended from the other part of the balance at A, and let area Z, suspended at A, incline equally to the BDG triangle holding where it now lies. I say that area Z is a third part of triangle BDG. 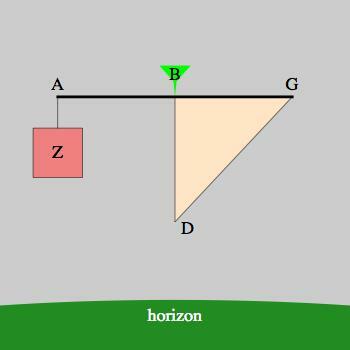 Let again line AG be a balance, and let B be its middle, and let there be hung at B triangle GDH, and let triangle GDH be scalene having base DH, but height equal to half the balance,(*) and let triangle DGH be suspended from points B, G, and area Z suspended at A incline equally to triangle GDH, holding as it is now positioned. Similarly it will be shown that area Z is a third part of triangle GDH. 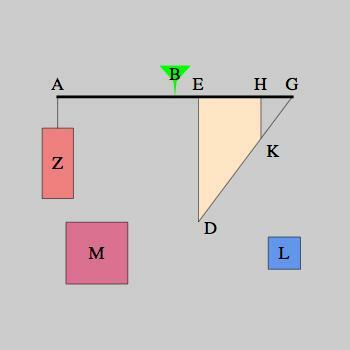 Let ABG be a balance and B its middle, and let it be suspended at B, but let triangle GDE be right-angled, having the angle at E as right, and let it be suspended from the balance at G, E, and let area Z be suspended at A and let it incline equally to GDE holding as it is now positioned, and let triangle GDE have to area K this ratio, that which AB has to BE. I say that area Z is less than triangle GDE and larger than K.
9. No proof is given. Go to a sample proof. 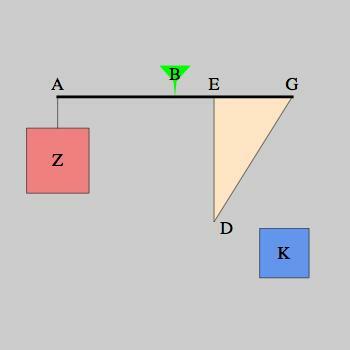 Let AG again be a balance, and is middle B, and triangle GDK be scalene having its base, DK, and height EG, and let it be suspended from the balance at G,E, and let area Z be suspended at A and let it incline equally to triangle DGK holding as it is now positioned, and let triangle GDK have this ratio to L which AB has to BE. I say that Z is larger than L, but less than DGK. It will be proved as in the previous case. 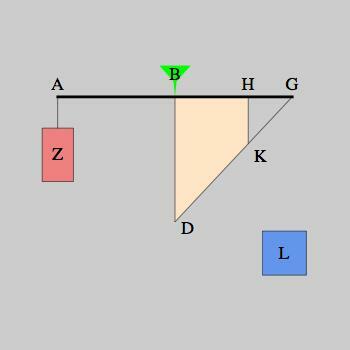 Again, let ABF be a balance and its middle B, and let BDHK be a trapezoid having right angles at points B, H, but side KD converging to G, and let trapezoid BDHK have this ratio to L that which AB has to BH, and let trapezoid BDHK be suspended from the balance at points B, H, and let area Z also be suspended at A and let it incline equally to trapezoid BDKH holding as it is now positioned. I say that area Z is less than area L.
11. No proof is given. Go to a sample proof. Again, let AG be a balance and its middle B, and let KDTR be a trapezoid having sides KD, TR converging to G, with perpendiculars DR, KT to BG, and let DR fall on B, and let trapezoid DKTR have this ratio to L, that which AB has to BH, and let trapezoid DKTR be suspended from the balance at B, H and Z at A, and let Z incline equally to trapezoid DKRT holding as it is now positioned. In a way similar to those earlier, area Z will be proved smaller than L similarly to those previously. 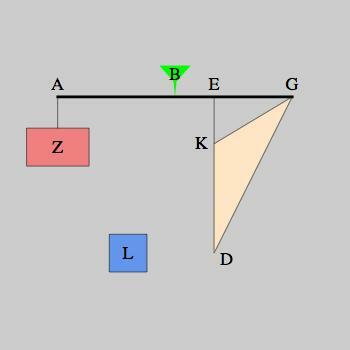 Again, let AG be a balance and its middle B, and let KDTR be a trapezoid having right angles at points E, H and lines KD, TR converging to G, and let trapezoid DKEH have this ratio to L, that which AB has to BH, and let trapezoid DKEH be suspended from the balance at E, H, and let area Z be suspended at A, and let it incline equally to the trapezoid holding as it is now positioned. 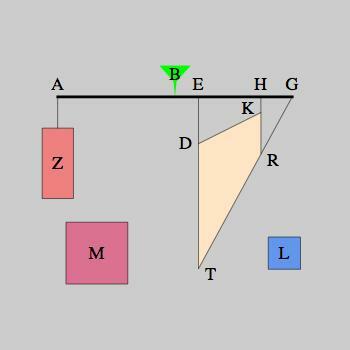 I say that Z is larger than L, but less than M.
Again, let AG be a balance and its middle B, and let KDTR be a trapezoid so that KD, TR are sides converging to G, and DT, KR perpendiculars to BG, and let it be suspended from the balance at E, H, and let area Z be suspended at A and let it incline equally to trapezoid DKTR, holding as it is now positioned, and let trapezoid DKTR have this ratio to area L, that which AB has to BE, and let the same trapezoid have this ratio to M, that which AB has to BH. 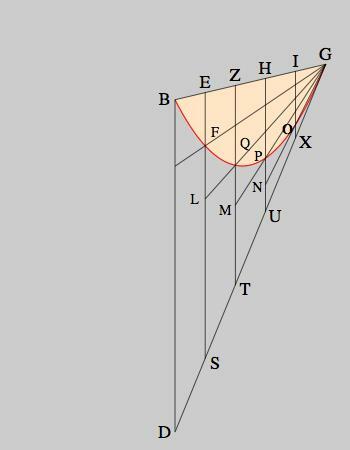 It will be proved similarly to that earlier that Z is larger than L and smaller than M.
Let there be a segment BQG enclosed by a straight-line and a section of a right-angled cone. First, let, in fact, BG be at right (angles) to the diameter, and let BD be drawn from point B parallel to the diameter, and let GD from G be a tangent to the section of the cone at G. In fact, triangle BGD will be right-angled. 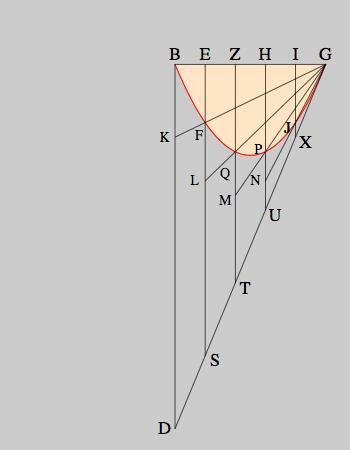 Let, in fact, BG be divided into equal segments, however many, BE, EZ, ZH, HI, IG, and let ES, ZT, HU, IX be drawn from the section parallel to the diameter, but let them be joined from the points at which these cut the section of the cone to G and extended. I say, in fact, that triangle BDG is less than three-times trapezoids KE, LZ, MH, NI and triangle XIG, but [is] larger than three-times trapezoids ZF, HQ, PI and triangle IOG. Again, let segment BQG be enclosed by a straight-line and section of a right-angled cone, but let BG not be at right angles to the diameter. It is necessary, in fact, that either the line drawn from point B parallel to the diameter be on the same sides as the segment or that the line drawn from G make an obtuse angle with BG. Let it be the line making an obtuse angle at B, and let BD be drawn parallel to the diameter from B, and from G the line GD touching the section of the cone at G, and let BG be divided into equal segments, however many, BE, EZ, ZH, HI, IG, and let ES, ZT, HY, IX be drawn from E, Z, H, I parallel to the diameter, and let them be joined from the points at which these cut the section of the cone to G, and be extended. I say, in fact, that triangle BDG is also smaller than three-times trapezoids BF, LZ, MH, NI, and triangle GIX, but larger than three-times ZF, HQ, IP and triangle GOI. Again let there be a segment BQG enclosed by a straight-line and section of a right-angled cone, and let BD be drawn through B parallel to the diameter, and (let) GD (be drawn) from G touching the section of the cone at G, and let area Z be a third part of triangle BDG. I say that area Z is equal to segment BQG. With this proved, it is obvious that every segment enclosed by a straight-line and section of a right-angled cone is a third again the triangle having a base that is the same as the segment and an equal height. If a straight line is drawn from the middle of the base in a segment which is enclosed by a straight line and a section of a right-angled cone, the point will be a vertex of the segment at which the line drawn parallel to the diameter cuts the section of the cone. In a segment is enclosed by a straight-line and section of a right-angled cone, the line drawn from the middle of the base will be a third again in length that drawn from the middle of the half. If a triangle is inscribed in a segment which is enclosed by a straight line and a section of a right-angled and has the same base as the segment and the same height, the inscribed triangle will be more than half the segment. Corollary With this proved, it is clear that it is possible to inscribe a polygon in the segment so that the left over segments are less than (any proposed area. For always more than half being taken away, it is obvious, on account of this, that by repeatedly diminishing the remaining segments we will make these smaller than any proposed area. If a triangle is inscribed in a segment which is enclosed by a straight line and a section of a right-angled cone and has the same base as the segment and height the same , and other triangles are inscribed in the remaining segments having the same base as the segments and height the same, the triangle inscribed in the whole segment will be eight-times each of the triangles inscribed in the left over segment. If a segment is enclosed by a straight line and a section of a right-angled, and areas are positioned successively, however many, in a ratio of four-times, and the largest of the areas is equal to the triangle having the base having the same base as the triangle and height the same, then the areas altogether will be smaller than the segment. If magnitudes are placed successively in a ratio of four-times, all the magnitudes and yet the third part of the least composed into the same magnitude will be a third-again the largest. Every segment enclosed by a straight line and a section of a right-angled is a third again of a triangle having the same base as it and an equal height.